"Just look at it. How can it do any harm?" 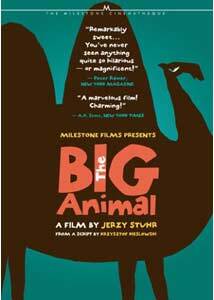 For cinephiles, the Polish-made The Big Animal comes from a script written by Krzysztof Kieslowski (Decalogue, Three Colors Trilogy)�directed four years after his 1996 death by longtime friend/collaborator Jerzy Stuhr. For some, that may carry the same weight as a lost Kubrick or Bu�uel, and certainly be as fine and dandy of a reason to celebrate this R1 release from Milestone. But don't be scared off by the Kieslowski name (or the presence of The Pianist cinematographer Pawel Edelman) if you're not really familiar with the work, because The Big Animal is a remarkably simple story, albeit one with a sub layer of symbolism that you're free to gloss over if you're so inclined. It is there for the taking if you want it, but what it's really about on the surface is a very mellow, very large circus camel who is accidentally left behind in a small Polish village. The beast eventually wanders into the garden of Zygmunt (Stuhr) and Marysia (Anna Dymna) and makes itself at home, inadvertently causing a rift between the villagers and the camel's new family. The backcover calls this a "fairy tale for grownups", and that's a cryptically blunt description that actually fits pretty well. Fairy tales serve it all up simple and lean, and as Zygmunt and Marysia become more attached to the camel, its place in the community becomes a sticking point for some buffoonish narrowmindedness on the part of the locals as harsh ultimatums are given. It's almost as if Zygmunt and Marysia are the only sane people in the kingdom�I mean village�because while their lives have clearly been enriched by the camel (who really steals every scene with all that crazy chewing) we know that at some point heartbreaking actions are going to be taken. As exasperated bank clerk Zygmunt, Stuhr holds his own onscreen with the camel, a certifiable challenge in its own right once you get a load of the hairy humpster. Their scenes together as they take frequent long walks through the country help give The Big Animal a lyrical, fable-ish feel, and the lazy reaction shots of the camel are surprisingly expressive and all-knowing, almost downright comical. Kieslowski's script certainly may carry deeper meaning than just being about a man with a camel, but this isn't the kind of film where you're hammered to death with the hidden subtext. That's the beauty of the way Stuhr presents this, because you are free and clear to make this as just being about a man and a camel, and if you do that it's alright. And believe me, it will actually make the final moments all the more moving. Image Transfer Review: Stuhr's film retains its original 1.33:1 fullframe aspect ratio, and the black-and-white cinematography of Pawel Edelman carries sharp, pleasing contrast levels. Blacks and greys look strong and well-defined, yet edge details occasionally appear a bit soft. The print itself, however, does carry a few specks and/or nicks, as well as the occasional sprocket mark. Audio Transfer Review: The Polish language audio is provided in 2.0 stereo, available with optional English subtitles. Clean voice quality, though there really isn't all that much dialogue to speak of. Extras Review: Extras give the filmmaker a couple of different opportunities to discuss The Big Animal, once during Controlled Destinies: An Interview With Jerzy Stuhr (30m:55s) and the slim Film Chronicle: The Making Of Big Animal (04m:36s). Both items were made for Polish television (and are subsequently in Polish), and are featured with optional English subtitles. Film Chronicle doesn't offer all that much, but the Controlled Destinies piece has Stuhr chatting amicably about his career, specifically his work with Krzysztof Kieslowski. Also provided here are a theatrical trailer and a detailed 20-page PDF entitled The Big Animal Press Kit, with bios on the cast, including the camel. A beautifully strange little story that is symbolic and touching without becoming syrupy, The Big Animal has a curiously sweet disposition beneath a surface layer of thick-headed intolerance, and I really hated to see this one come to an end.